When 16 year old Otelo Buthelezi, his best friend, New Year, and his 12 year old brother, Ntwe, are invited to the beach-house of their new friend, Tau Modise, they step into a world previously closed to them. It is exactly the opposite of their township- a place under a constant and growing threat from political violence, driven by Inkatha hostel dwellers on one side and township United Democratic Front comrades on the other. 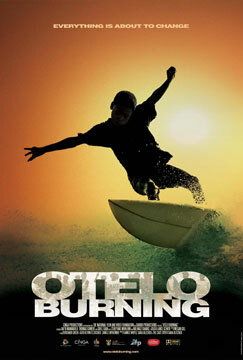 Soon, everyone recognizes that Otelo is gifted on the water, a god in waiting for his purpose. An older white man, Kurt Struely, approaches the boys, certain of their potential and invites them to his home to watch some professional surfers on video. He paints them an enticing picture of the life to be had, if they can master every kind of break - money for nothing and the chicks for free.